A FULL CLOSET, BUT NOTHING TO WEAR… How can you make getting dressed easy and delightful? Is it possible to pick one item knowing that it is “friends” with other parts of your wardrobe? Here are tips for IndexCard Cure™ readers. Most of my knowledge of the subject comes from reading books and blogs about French Women and their elegance. From what I have learned, they are usually very stylish, do not follow trends, and have their own unique look. For the most part, they do not have closets—probably many of their apartments are not much bigger than some of the walk-in closets in the large homes in U.S., therefore, the limit of space requires a small wardrobe. I think the first step is to determine your style. Am I classic, quirky, elegant, simple, traditional, trendy, etc.? The next step is to determine, “What works for me on a day to day basis?” Do I need professional attire for a job and something different for the weekend? Do I need additional workout clothes? Do I sometimes need formal attire? Along with style, consider what colors work for you. Most of what I have read tells you to consider what goes well with your skin, hair and eye color. A capsule wardrobe begins with neutral pieces, so your neutral should be the best for your eye, skin and hair color. Most often neutral is thought of in terms of black, grey, tan. But your neutral can be whatever color looks best for you. After you have done those steps, evaluate your closet, keep what works and get rid of the rest. When it comes time to add to or replace your wardrobe, buy the best quality you can afford and that fits you. If you can do it yourself or can find a good tailor, have your clothes tailored so that they fit you well. 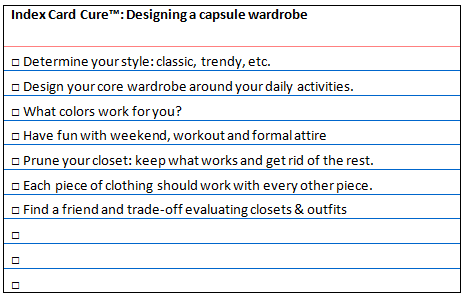 For most capsule wardrobes, workout clothes, formal clothes, winter coats, rain gear etc. would not be part of the capsule wardrobe. I think one could worry this to death—well, I ride horses, therefore I need my special riding gear, I climb mountains, therefore, I need my mountain climbing gear, I am an ice skater, dancer, etc. therefore I need my special gear. From what information I have gathered, none of those are considered in the capsule. If you work in an office where dresses, suits, etc. are the norm, then your wardrobe could consist of 2 dresses, 3 skirts, 2 pair of pants, 2 sweaters, 2 shirts, 2 tee shirts, one jacket and one blazer. You could also have 2 pair of flats, 2 pair of heels and one pair of boots. Your pants, skirts, blazer and jackets would all be some variation of your chosen neutral. The sweaters, blouses, and tee shirts could be coordinating colors. For example, your chosen colors might be grey, teal and cream. Each tee shirt, and shirt would work with all pants, skirts, jacket, blazer and sweaters, the dresses would work with the jacket and blazer and possibly the sweaters or shirt. You can add color pops with scarves, jewelry, shoes or bags. Depending on where you live, you may also need seasonal wardrobes. Some of the pieces would work for more than one season, some would be summer only, winter only. 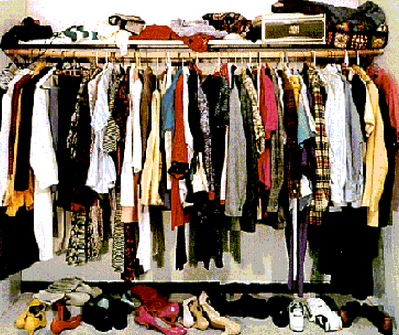 There are many good and not so good websites about capsule wardrobes. I found some of the best sites by googling French Chic Wardrobes. □ What works for you on a day to day basis? □ Design your day-to-day wardrobe around your daily activities. □ What colors work for you? □ Prune your closet: keep what works and get rid of the rest. □ Each piece of clothing should work with every other piece.